When ghost hunting, it is important that you have the best possible kit. However, that doesn’t always come cheap. The Toguard Night Vision camera is an absolute bargain at just £59.99 and having compared it to some of its more expensive competitors, it provides the same if not better quality footage. We have tested this camera over 8 different investigations, both indoors and outdoors and in a variety of different environments. It was even used in temperatures of -5 while investigating Bran Castle in Transylvania. The camera has a proper screen built in, something not many of the night vision cameras have. This is a fantastic feature as it enables you to see where you are aiming it ensuring you get your investigation area framed. With many of the others, it is a case of point it and hope you have angled it right, which can be very frustrating. The only downside of this is that it will consume more battery, but the screen has an auto off feature so that when you are set up, it will turn itself off conserving as much battery as possible. The footage you get from the camera is crisp and almost HD quality, even in the darkest of environments. The idea behind this camera is that you can set it up in a locked off room and it will auto record whenever it detects motion. It does this perfectly and we have used it successfully on many ghost hunts. 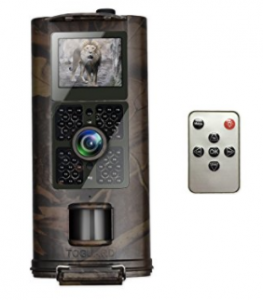 However, we have also carried it around and used it as a regular video camera, but with the added benefit of being one of the best night vision cameras you can buy. Unlike many of the handheld night vision cameras, the depth the IR light can penetrate is brilliant. It can light up an entire room allowing you to see in night vision right into the darkest corners, this is not something you can do with any of the handheld night vision cameras unless you are willing to pay well over £1000. This is one of the best night vision cameras on the market and one we recommend and use on all our investigations. Next: Next post: What is Cryptozoology?